On one of the visits Ellen went with us. As usual, mom had snacks in the car for the drive and this time it was spray cheese and crackers, some of my favorites. While I was putting the cheese on a cracker the cheese popped! There was a large air bubble and it sprayed cheese on the roof of the car. As you can expect we all jumped and as soon as mom saw I was okay we all laughed. A few minutes later I quietly tried to get mom's attention. Once I did I pointed to the back of Ellen's head and with my hand over my mouth giggled. Ellen noticed and said, "Brock...What did you do?" She then felt the cheese on the back of her head. She then started laughing again and said she wasn't my cracker. Ellen was so funny. I enjoyed teasing not only my family but my pet cat Cleo. Mitch and I were always teasing her by putting her in a laundry basked and sitting on top of the basket. She would reach through the sides and try to reach our legs. I had a stuffed animal that would wiggle all around when you pushed a button and Cleo hated that toy. So, I would put her in the bathroom and then throw the activated stuffed animal in the room before closing the door. I always would cover my mouth and giggle. I liked teasing mom too. Sometimes she would take a long time curling her hair. When she was all done she would ask me how she looked. My response would always be, like a girl. She would then say, "Good, that's the look I was going for." As you have probably noticed I had a bit of an attitude. Whenever I would get really ornery mom would ask if I had an attitude to which I would loudly say, "I DON'T.. HAVE.. A ..TUDE!" I don't think she believed me. Like dad I really enjoyed all kinds of music. In my treasure drawer were several of his 80's hair band cassettes as well as Garth Brooks CD's that I had been given as a gift at the hospital. Mitch and I also enjoyed dancing around to the Veggie Tales songs while watching the videos. Grandpa Walquist had bought me an old guitar at a garage sale and I would sing my own version of Garth Brooks' Friends in low places. I also had the black hat and sunglasses to finish the look. We had been helped and encourage by others during our time at the hospital and now I was given the opportunity to help someone else who was going through the same thing. One of my grandma Lona's patients was struggling with losing his hair due to chemo. My grandma had me talk to him and I shared my vast wisdom with him. Kisses stick! When you have a bald head and a girl kisses you, they stick. I believed this because there were always lip prints on my bald head when mom would kiss me. It made him smile and I think it helped him. After a few years dad started working at Home Depot. It was so awesome because on Saturday's mom would take Mitch and I to the store and we would participate in their kid's craft classes. I would always get ready early; have my hair all slicked back and my Home Depot apron on. I would tell mom I was going to work with dad; I wanted to be just like him. 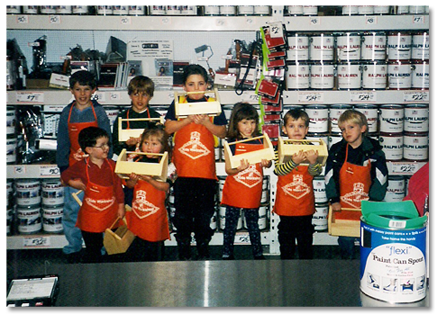 We made all kinds of wood crafts like birdhouses, toolboxes, bug traps and picture frames. The whole staff knew us and made us feel like family. I was now 5 years old and finally I was able to start kindergarten. I felt like a big kid getting all dressed up for school and filling my Winney the Pooh backpack with my new school supplies. I loved school and didn't want to miss a day. Grandpa Walquist had given me a set of spurs and I took them for show and tell. My teacher let me wear them at recess and I walked around the room listening to the clang of the metal. I wore my cowboy boots and spurs as often as I could. Now that some time had passed more side effects were showing up. One day while eating my lunch, chunks of my teeth broke off. I wasn't even eating anything that was hard. I handed my teeth to mom and she contacted the doctor. They arranged for a dentist in the area that was familiar with cancer patients to see me and make a plan for my teeth. My scans had shown that buds for my adult teeth were present; however it would be some time before they grew in and I needed teeth in the meantime. Rather than have several visits to fix my teeth a decision was made to sedate me and cap all my teeth at once. When I woke up from the procedure I was so happy to have new teeth. Mom started calling me Hollywood because I smiled so much. 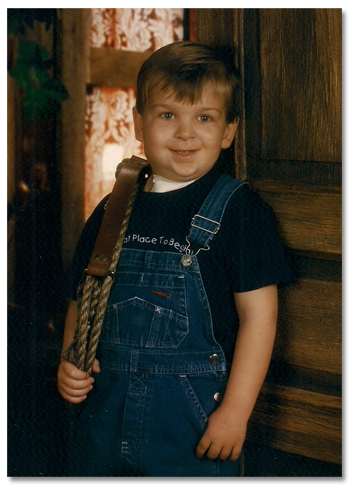 It was December of 1998 and I had just finished another round of scans. Everything came back clear and I was placed on 6 month scans. That was such great news. Once I reached 2 years of clear scans I would be considered in remission. The two year goal date was June of 1999. I would be 6 years old.